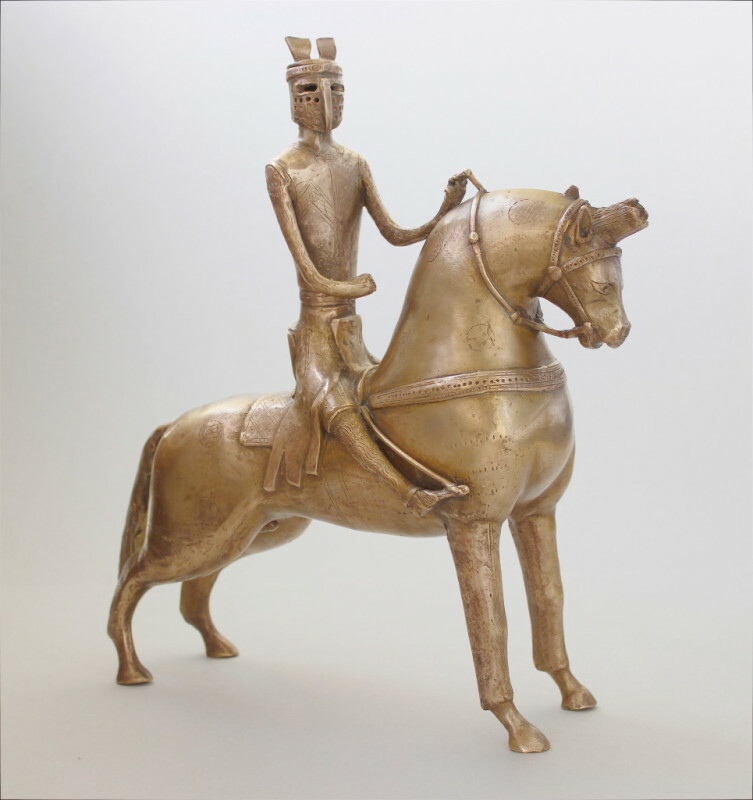 This aquamanile in the form of a knight on horseback was cast in 2015 in Bastian Asmus’ workshop, and leans heavily on an original from the 13th century. It was cast in bronze by the lost wax technique. Next to lion and griffin aquamanile a knight on horseback was a widely used form of aquamaniles . One of these I made earlier this year and cast it in bronze in my workshop. The original aquamanile is from the 13th century from northern Germany, probably around Hildesheim. This object displays the impressive skills of the 13th century artists and foundrymen. The arms, legs and stir-ups are modelled full round, which adds quite a bit of complexity to the preparation of the casting mould; especially when we are considering that these moulds were not made like modern investment moulds, but by applying moulding loam to every bit of wax surface. The materials thickness of the bridle or stir-ups is in places less than 2mm in diameter. The knight is not modelled separately but cast in one piece with the horse. Just as the griffin aquamanile this reconstruction can be seen in the newly opened European Hanseatic League Museum in Lübeck, Germany. Aquamanile in the form of a griffin. The original is from a 15th century Nuremberg Rotschmied workshop. The pictured aquamanile was modelled by Ragna Asmus and cast by Bastian Asmus. I realise that I have been somewhat negligent over the past three to four months when it comes to writing. I was immersed in the most fascinating and satisfying work in the past four months, however and simply did not have time to write. Within the next few weeks I will post about the 12th to 15th century bronze and brass objects I was commissioned to reconstruct. Let us begin with my favorite piece today: The griffin aquamanile that is now housed in the Metropolitan Museum in New York. 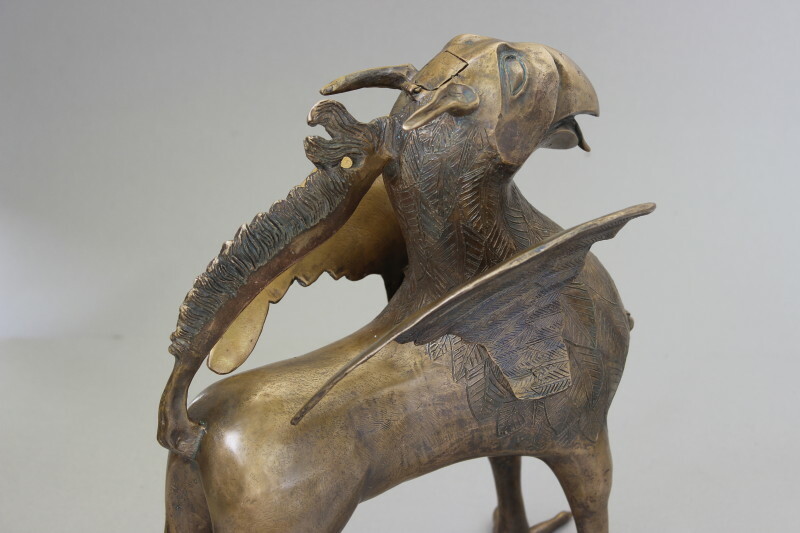 This bronze aquamanile in the form of a griffin was cast in early 2015 and can be viewed from 30 May 2015, the newly established European Hanseatic League Museum. 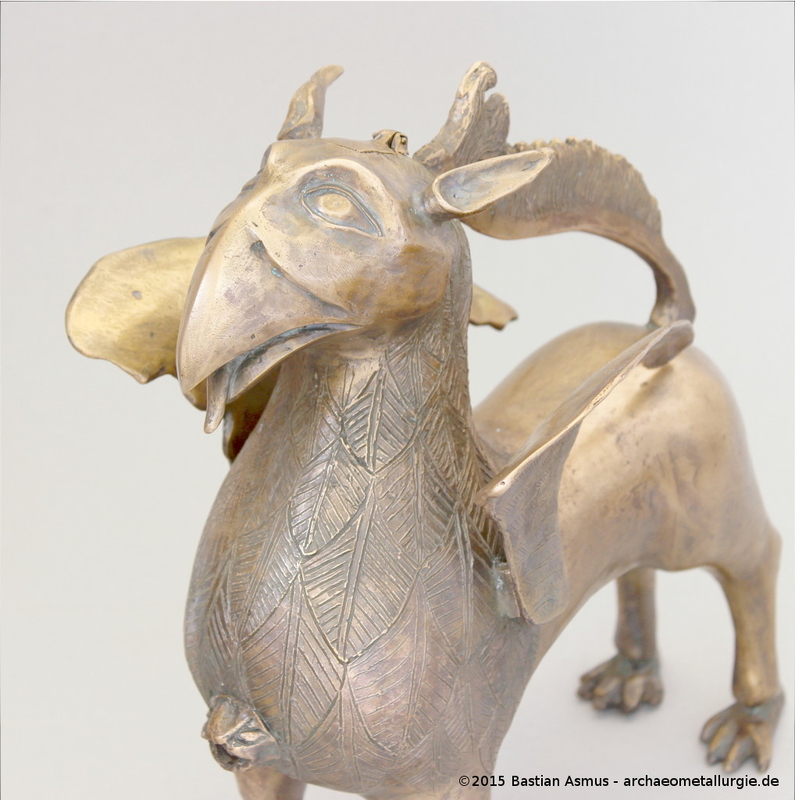 The Griffin was modelled by Ragna Asmus after a griffin aquamanile that was made in Nurmeberg between 1425 and 1450. It is significantly younger than the lion aquamanile I have made two years previously. In the 15th century Nuremberg was a leading centre of the brass and brass-ware production and had surpassed the importance Dinant held in the 12th and 13th centuries. From the 14th century the production of “Dinanderie” shifted from Dinant and the Meuse region to Nuremberg. After Dinant’s destruction in 1466 the metal trades in Nuremberg became an even more important one than Dinant ever was . The numerous professions in the Rotschmiedehandwerk may be seen as an evidence of this upsurge in productivity. This aquamanile was completely remodelled in bee’s wax and cast in the lost wax process. Aquamanile in the form of a griffin. The casting of an aquamanile in original medieval technique has been a long term intention of mine. A year ago I made an aquamanile in the form of a lion that dated to the medieval period, however I did not have time to cast that particular aquamanile in a technique that can be considered medieval.- The model however was made with the techniques known to medieval artificers. It was made according to Theophilus Presbyter’s description in his schedula diversarum artium , a 12th century manuscript on artisan’s techniques. Theophilus’ chapter 61 on the making of the cast incense burners provides all the necessary information, with which an informed reader can go ahead an produce a formidable bronze (or any other copper alloy) casting. This information was used to prepare the mould for the casting of this aquamanile. There will be an article shortly on how to make the mould. Loam mould of the lion aquamanile. The loam mould consists of the same ingredients as medieval moulds. 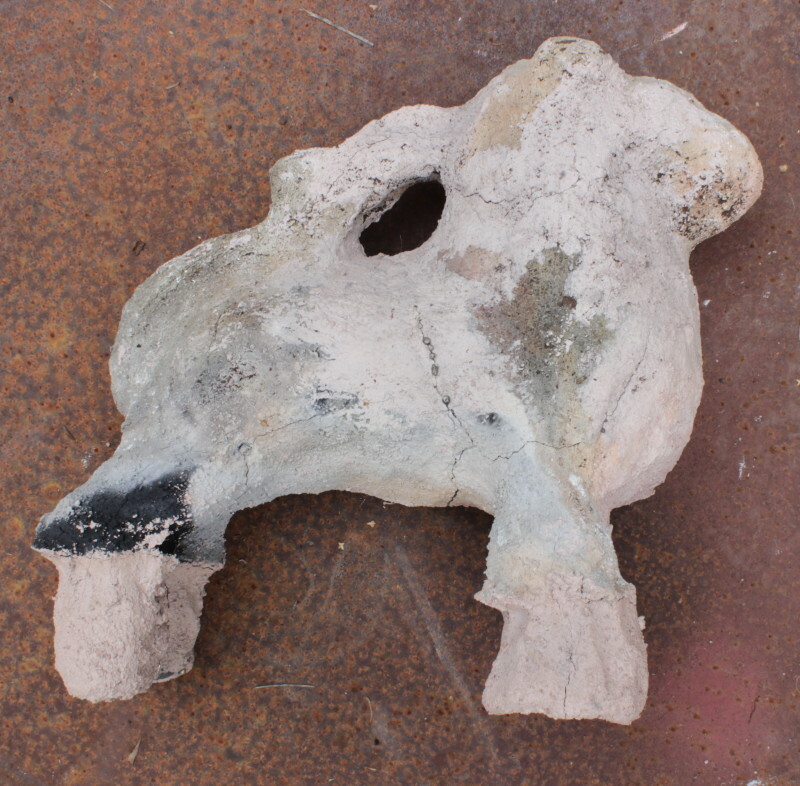 The mould was prepared from loam and made three days before the casting. The wax model was molten from the loam mould over embers. The mould was subsequently fired with charcoal. The charcoal was allowed to burn down to the top of the mould and before it was charged again with fresh charcoal. This was repeated three time s, just as Theophilus tells us . 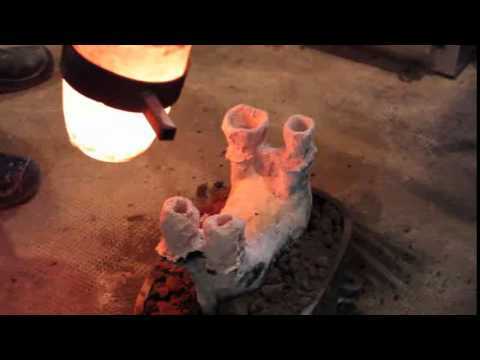 The casting was accomplished through the feet; so the mould is placed upside down for the casting. It was cast with a quaternary alloy of copper, zinc, tin and lead. The alloy is CuZn13Sn8Pb2 and was prepared for the casting.